Hello December! I guess it’s officially time for me to start worrying about holiday preparations, especially when I see so many of you finishing up little gifts, buying more supplies and carrying around trees and decorations. There are just six days until the Holiday Trunk Show and there are going to be lots of wonderful gift options there. I just have a sneaky feeling that I’m going to end up buying myself a whole lot of presents rather than the people on my list. For sure, I know that I will be checking someone off my list with something from Dear Sukie’s trunk. I can’t think of a more perfect gift for one of my dearest friends. 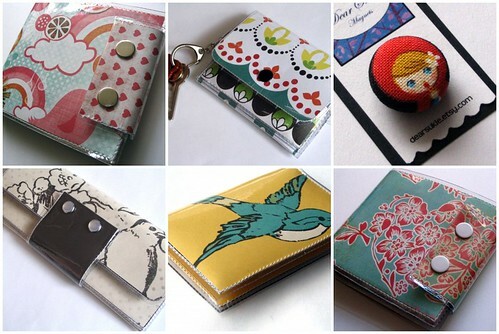 Kristy Boucher is the girl behind these fabulous wallets that I’ve been spotting in people’s purses for a while now. Tell me where the name ‘Dear Sukie’ came from? Kristy : The name Sukie comes from my favourite tv show Gilmore Girls! Kristy : I guess I have always liked making things, doing crafts and drawing since I was little. I started by learning how to knit but I’m not very patient and it takes sooo long to complete a knitting project, so then I turned to sewing. I love paper and patterns so I came up with combining paper and sewing and making accessories which I also love. When did you make your first wallet? I love that you have so many versions, perfect for everything from business cards, money and even mini moo cards! Kristy : I made my first paper/vinyl card holders about 2 years ago and started selling them online on Etsy shortly after. What’s the thing you’ve made that you’re most proud of? Kristy : I really like my new Pocket Wallets. I like that they are compact but can still hold a lot of cards and money. Are there any local artists or makers who inspire you? Kristy : A lot of them! Most of all is my boyfriend who is a jewellery designer. He has been very supportive and encouraging for me to start my own business. Also, I have always loved the work of Three Green Apples. Her designs are very cute and well made and she photographs her work beautifully. Kristy : I would really like a good quality camera! Visit Dear Sukie on Etsy! 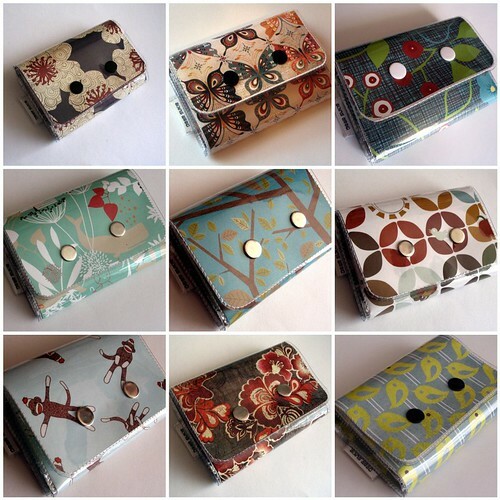 I have one of your lovely wallets and wondered if you would be interested in doing a small craft show in the Beach. It is on September 11 for a few hours. It will be very busy and I think you would do well. Please let me know right away. Thanks so much!